A student leaves Columbine High School late Tuesday in Littleton, Colo. The school was closed Wednesday while authorities looked for a woman they said presented a credible threat ahead of the 20th anniversary of the mass shooting there. The FBI says an "armed and dangerous" 18-year-old white woman obsessed with Columbine is dead from an apparent self-inflicted gunshot wound. Because of warnings about the Florida woman named Sol Pais, more than a dozen school districts in Colorado were closed Wednesday. The 20th anniversary of the Columbine High School shootings is Saturday. Dean Phillips, the special agent in charge of the FBI's Denver field office, said on Wednesday afternoon that law enforcement officials found Pais' body during a search of the Mount Evans area, a Rocky Mountain peak west of Denver. Law enforcement officials in Florida had informed the FBI in Denver that Pais posed a potential threat. "We took it as a credible threat to the community and potentially a threat to schools in the area, although non-specific to any particular school," said Phillips. On Tuesday, Phillips had explained that Pais had "made some concerning comments in the past" and had an "infatuation" with the 1999 Columbine High School shooting and its perpetrators. Pais had "purchased three one-way tickets in successive days on the 15th, 16th and 17th" from Miami to Denver, Phillips said Wednesday, and ultimately used the first ticket. When she arrived, she "went directly" to a store where she bought a firearm. She was last seen on Monday in the Mount Evans area, where Phillips said a "for-rent vehicle" dropped her off. It's not clear when she died. Multiple law enforcement agencies launched what Phillips called a "massive manhunt," ultimately finding her body late Wednesday morning. Phillips added that she appeared to be alone and "took her own life with the weapon she procured," though authorities are continuing to investigate whether she had any accomplices. Law enforcement officials have said that Pais had no specific known connections to Colorado. Denver Public Schools were closed Wednesday, as were Jefferson County (Jeffco) Public Schools, of which Columbine is a part. Fourteen other school districts in the area were closed as well, according to Colorado Public Radio. 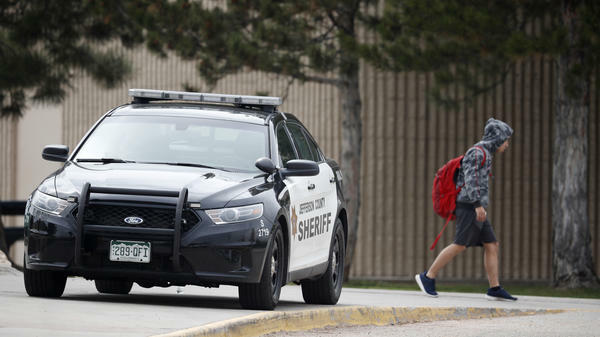 Columbine High School and several others in Jefferson County had been placed on "lockout" Tuesday, which means entry and exit were restricted while classes continue as usual. "We take these threats seriously," Jefferson County Sheriff Jeff Shrader told reporters. It's "not the first threat" to involve or reference Columbine, he said, and "I know that this opens a wound especially on an anniversary week." Jason Glass, the superintendent of Jeffco Public Schools, told reporters on Wednesday that officials are planning for students to return to the classroom on Thursday, "with heightened safety and security procedures, and ongoing vigilance in the days to come." Events during this anniversary week "will continue as planned," he added. "The shadow of Columbine looms pretty large here in Jeffco, as it does across the state and the country," John McDonald, the executive director of school safety and security at Jeffco Public Schools, told reporters. "We know that Columbine continues to attract people from around the world," he said. McDonald discouraged visitors. "If I have any message — we're not a place to come visit if you're not a student, if you don't have business there. We're not a tourist attraction, and we're not a place for you to come and gain inspiration." Two students at Columbine High School killed 13 people and then killed themselves on April 20, 1999. Twenty-four other people were injured. The incident has inspired other school shootings, researchers and journalists say. In the time since, Jefferson County Public Schools has built what The Washington Post described as "likely the most sophisticated school security system in the country" that includes remote-control locks, cameras, a 24-hour dispatch center, and monitoring of certain students and their social media accounts. If you or someone you know may be considering suicide, contact the National Suicide Prevention Lifeline at 1-800-273-8255 (En Español: 1-888-628-9454; Deaf and Hard of Hearing: 1-800-799-4889) or the Crisis Text Line by texting HOME to 741741.